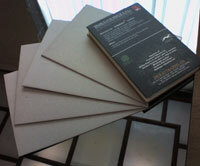 Amol's MAXBOARD™ is a machine-made, multi-layered paperboard (composite board) made fully from recycled paper. MAXBOARD™ is used in the production of displays and show-cards, jigsaw puzzles, game boards, book covers, lever-arch files, albums, diaries and many similar items where a flat, rigid base or cover is essential. What are MAXBOARD's prime properties? MAX Rigidity: MAXBOARDTM is extremely rigid, ensuring a strong, stable end-product. The perfect lamination of board layers prevents them from coming apart during usage. MAX Flatness: MAXBOARDTM is a "lay-flat stay-flat" board with accurate callipers and sizes. Its even surface makes it suitable for lamination with various materials, including foil. MAX Stability: MAXBOARDTM is dimensionally stable even over long term re-use. This ensures that your products remain flat and stable in different climates. MAX Economy: The board's surface has the right absorption properties to allow quick and economic gluing. MAX Choice: MAXBOARDTM is available in thicknesses from 800 microns through 3000 microns. Minimum sheet size is 500x500mm and maximum is 1600mm x 2400mm, arguably one of the largest in the world. Special sizes can be produced on request.